An applicant submits an application. The application will then be routed to multiple approvers in parallel. Each approver will need to either approve or reject the application. The list of approvers will only be known at runtime. Once any approver rejects the application, the applicant will need to change and resubmit it again. 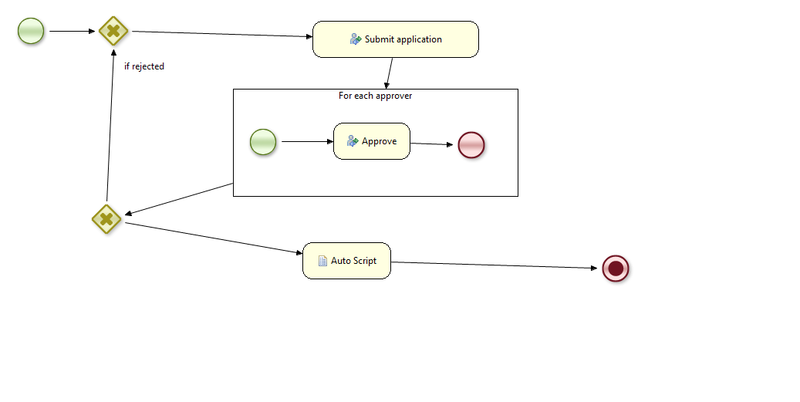 I am able to achieve step2 by putting the the "approve" human task inside a "multiple instances" node. 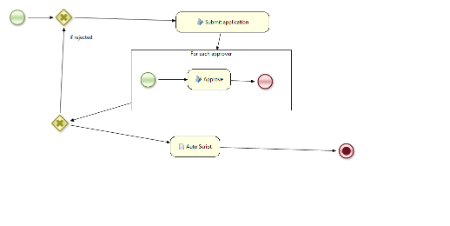 My question is when one of the approver rejects the application, how do I notify those tasks pending approval. Preferrably, I want to cancel those task since they are no longer valid. Can I put something in the exit action to accomplish this? I can really use some help here. anyone? as an alternative I would give it a try with n out of m pattern with parallel & complex gateway, so the converging gateway could decide if the flow shall continue when rejection was encountered. thanks for the insight. I think option 1 is exactly what I was looking for. I only know of one way to find and cancel other user tasks. below is my code. Is there other better to achieve this? Any help is appreciated. thanks !